The Terrafugia Transition, closest thing to a flying car yet built, has received a unique exemption from the US government allowing production models to be 110 pounds heavier than a normal "light sport aircraft". This will permit the car/plane combo to satisfy safety requirements when driving on roads. The Transition has been under development by startup firm Terrafugia, founded by flying-enthusiast MIT engineers, since 2006. It is basically a normal light single-engined plane with folding wings and a more substantial, four-wheeled undercarriage. With wings folded a Transition can be driven on roads at normal highway speeds. On reaching an airport - or a suitable bit of private land, with the owner's permission - it can extend the wings and make a normal rolling takeoff to cruise the skies at 115mph. On landing, the usual hassles with finding hangar or tiedown space and getting a cab or hire car onward to one's destination don't apply. The Transition simply drives out of the aerodrome gate and parks wherever it's going - fitting in a standard size garage if one is available. If bad weather should close in before the return journey - a constant worry for private pilots who don't possess instrument ratings - no matter. The Transition can simply drive home. Handily, the plane-car was originally designed to fit within a weight limit of 1320 lb, meaning that it could qualify as a "light sport" aircraft. A US light sport pilot's licence is significantly easier and cheaper to get than a normal private ticket, requiring only 20 hours logged, and red tape is lessened. However it seems that in fact it was proving very difficult to fit mandatory road-safety features such as crumple zones, airbags and a structural cage around the passenger compartment into the 1320lb weight limit. Sportingly, the FAA have now agreed that the Transition, uniquely, can have another 110lb of leeway and still count as a light-sport plane. 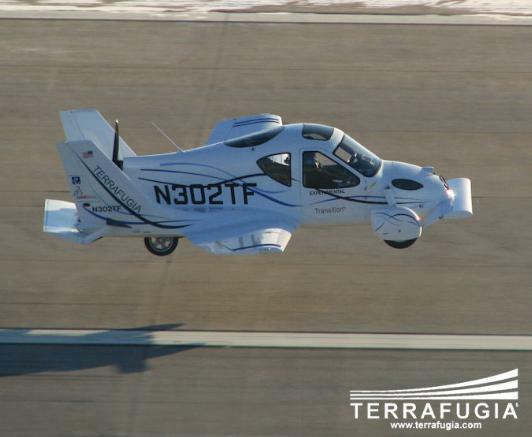 Terrafugia originally planned to commence deliveries of production aircraft last year, but in the event got only as far as test flights of a "proof of concept" prototype. This was mothballed after 28 flights, however, and the firm then said it would build a "beta prototype" which it now refers to as the "production prototype". Graphics of this - though not an actual airframe - are to be revealed at this summer's OshKosh air show.